You should also know that flood damage is specifically excluded from all basic homeowner’s policies. 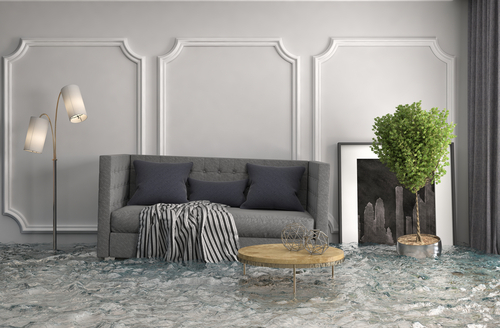 Fortunately, you can purchase a separate Federal Flood Insurance policy through one of many private insurance companies that write and service the policies for the government. Nearly 21,000 communities have cooperated with the federal government to establish stricter zoning and building measures to control flood damage.3 In return, those communities qualify for insurance protection through the NFIP. The program makes a Flood Insurance Rate Map (FIRM) that shows base flood elevations, risk zones and flood plain boundaries. The FIRM sets the insurance rates for buildings in the community. Flood zone information is available from local government, real estate professionals and insurance agents. “V” zones are the most hazardous and most expensive areas to insure. They generally include the first row of beachfront properties, which are subject to wave action. “D” zones have not been studied, but flooding is possible and insurance is available. Unlike homeowner’s insurance, flood protection is not designed to return a home to its pre-disaster state. It is meant to help flood victims avoid financial ruin. Residential buildings may receive up to $250,000 in coverage, while coverage for non-residential buildings is limited to $500,000. A separate contents provision may be added, but coverage is limited to $100,000 residential/ $500,000 non-residential. There are separate deductibles for buildings and contents. Flooding is the most widespread natural disaster.4 Could a flood ruin you? That’s the $250,000 question to answer when deciding whether you need flood insurance.